Be sure to visit the downloads page to give the latest version a try. If you are able to translate StackApplet to another language, that would be awesome! If not, you can still help by reporting bugs and issues that you come across. It's called StackApplet. It's a status icon that notifies you of answers, comments people post to you, and reputation changes. Note: to add this site, click the icon and click preferences. Type "askubuntu" into the site name field. Type your user ID into the other. Then click "Add to List" and click "OK". Second note: The code for this app is on Launchpad. 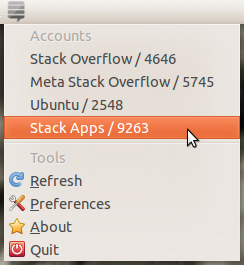 Third note: StackApplet 1.4 is in the Ubuntu 11.10 (Oneiric) repositories. A maverick Version would be great. There was an error retrieving information from StackAuth when StackApplet was initialized. The preferences dialog cannot be displayed. Please note that this is not an error in StackApplet - either a misconfigured Internet connection or StackAuth failure are likely the problem. I'm running maverick, and my internet connection seems fine. Is there a reason why I can't connect this to my Programmers SE account? The icon just says 'Please wait...' endlessly. Also, how do I get a context menu like that seen in the screenshot? Are you planning to add a text display of the total rep for a selected site to the indicator's icon (similar to what the system temperature indicator does)? Not the answer you're looking for? Browse other questions tagged discussion applet . Rejected all of my edits, left the question un-modified and attached a bounty?